A family owned business located just outside Roanoke, Virginia, offering the materials, plants and services to make homes and commercial properties look their absolute best! Our experienced staff can supply you with the most creative ideas to make the best of your environment, both in beauty and functionality. We´ll share our ideas with you to make the very best of your projects. STILL UNDER CONSTRUCTION......... Check our product catalog to see what is currently available. With a 20 acre farm, we are always Growing Excellence! From ornamental to evergreen trees, we have something to add value to your landscape. Great prices for homeowners tackling a weekend project, as well as wholesale pricing available to nursery and landscape businesses. Call 992-5583 today to make an appointment to tag your trees for purchase! There is no place more known in Southwestern Virginia than the prestigious Hotel Roanoke. To provide our customers the best quality and serivce and a sense of beauty in a serious business with no boundaries. Growing Excellence for Over 30 Years! 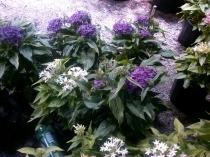 Copyright © 2012 Creative Nursery & Landscaping . All rights reserved. | Administration | WebMail | Website by SayItOnTheWeb, Inc.